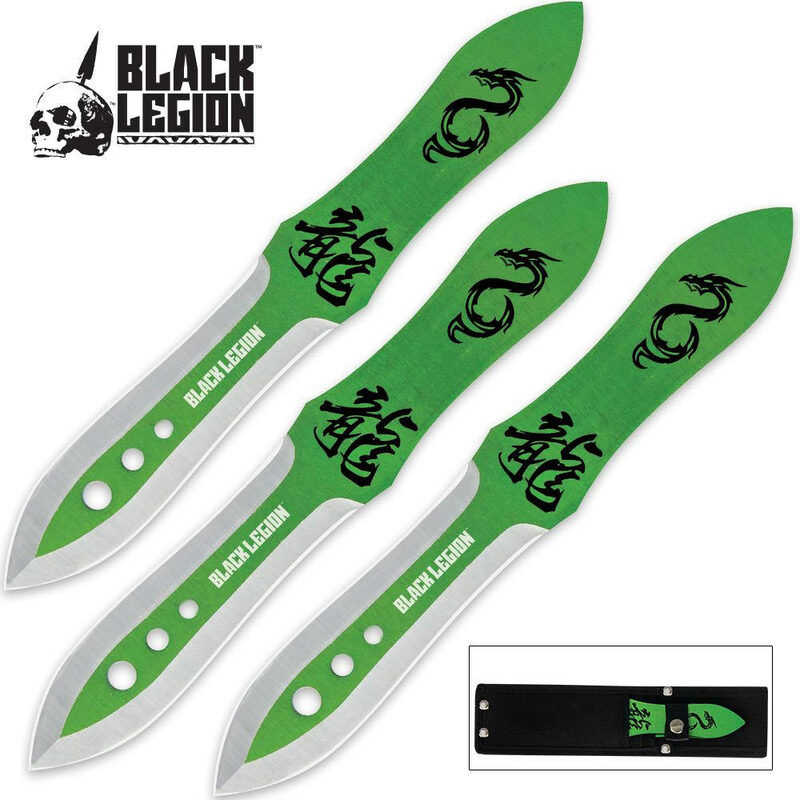 Mystic Green Dragon 3 Piece Throwing Knife Set – 8.75 In. One-piece solid stainless steel construction with sharp double edges and a piercing tip for maximum target penetration. Each blade features an attractive two-tone green and silver finish with black etchings. These dragon throwing knives will be an excellent addition to your throwing knife collection, whether you're an accomplished thrower or new to the spot. Includes nylon pouch/sheath. Okay, i bought these a while back and I must say that i like them a lot. They were shipped super quick and easy. They are not super sharp, but closer to the tip, the sharper you get,, which is perfect for a throwing knife. The price is just right and i recommend them to anyone who wants to start throwing knives, but do not want to shell out $20+ for one knife. I did already chip the blade of one of the knives, but that is not a concern to me since these are a beginner set. These look amazing, and are super balanced, dont be afraid to get them. I brought these knives as my first set of throwing knives they are nicely balance sharp and very durable. I have enjoyed this purchase and have gotten very good use out of theses and would recomend them for any one that is thinking about getting into throw knives.